"Text me when you get off the bus," I tell Chris and when I get his text I put our shoes on. I grab a ball and Noah and I putter around the flowers and small yard (that belongs to the downstairs neighbor who doesn't seem to live here) to wait. 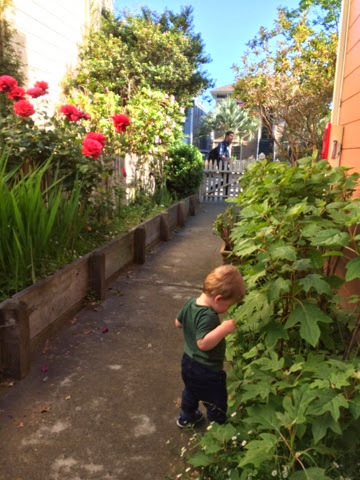 This evening I caught a picture of Chris coming up the walk while Noah played. There were a lot of good moments today, but that one was a highlight. In the garden I spotted hydrangeas and roses, lettuce and ivy. When they talk about San Francisco as a foggy place, they cannot mean Berkeley. So far Berkeley has been sun and flowers and delight. I know it's early days, but Chris said it best earlier. "I feel like we just got a life upgrade." I love reading about you!